Take the right approach to getting rid of this unhealthy, unsightly organism—for good. Untreated dampness on carpet—whether caused by a persistent leak, overzealously watered plants, or a not-quite-housetrained puppy—can create mold growth in a matter of days. And mold, which can appear as green, gray, or white patches on carpet and add a strong musty odor to a room, can lead to chronic allergies, asthma, even bronchitis. While you may be able to mitigate smaller spots of mold yourself, sections greater than 5 feet in width require treatment by professionals, because it’s likely the mold has invaded the underlay or flooring, which is much harder to remove. In cases both small and large, it’s critical to act fast; mold is a living, growing organism, and spores spread rapidly. 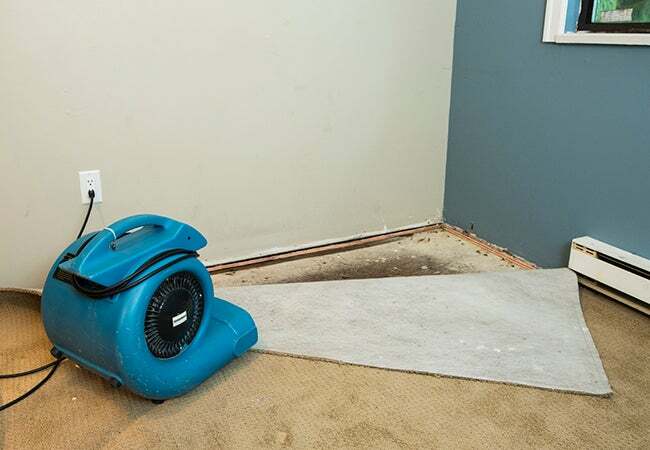 Keep in mind that you must determine how to get mold out of carpet as well as address its root cause—groundwater seepage or other external factors must be resolved at the same time. There are various means for how to get mold out of carpet, some more effective than others. Natural anti-fungal remedies, such as vinegar and tea tree oil, are known to “inhibit,” not kill, mold. Bleach can banish mold, but it can also discolor carpet. So an anti-fungal spray designed to kill mold, available in retail stores and home centers, maybe be your best bet. Ventilate the space by opening windows or, if possible to remove the rug, take it outside to treat it. While not all molds are a health hazard, it’s best to proceed cautiously by donning a facemask, eye protection, and rubber gloves before you get to work. If you cannot remove or lift the carpet, proceed by treating the visible surface mold. If its is possible to lift the carpet, do so until you reach the the area with mold and examine the backing. Backing with substantial mold growth of more than a few feet in width should not be merely cleaned—you’ll need to replace the carpet. If that’s a price you’re not prepared to pay, you can opt to cut off the mold-covered area with a 12-inch border past the damage and insert new carpet, instead of replacing the entire room. Be sure to remove and replace the portion of underlay or carpet pad as well to thwart mold’s return. 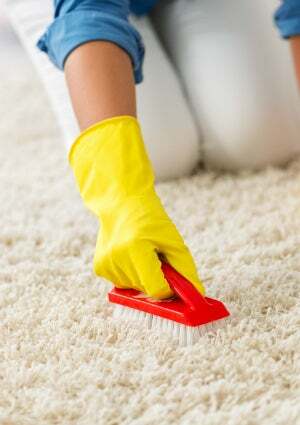 Scrub the surface of the carpet with a dry, stiff bristle brush to remove the visible mold spores. Brush these into a dustpan and discard it in a trash bag. (Vacuuming is not recommended, as spores on your vacuum can be spread to other areas in your home.) If you can brush-scrub the back of the rug as well, do so. Thoroughly saturate the moldy area, and at least 6 inches around it, with anti-fungal spray that specifies it’s safe for carpets (it should also boast a “mold barrier” or mold-prevention). If able to lift or remove the carpet, spray both the front and the back. Also spray the area of the floor the moldy portion was in contact with. Let the anti-fungal spray sit for an hour. Blot the anti-fungal spray with a dry, clean, disposable rag to soak up excess. Do not rinse the area with water or any other treatment. The anti-fungal agent will continue to work until it has fully dried. Resist using a fan to accelerate drying; that can blow mold spores elsewhere and create new problems. Instead, close your windows, turn the heat up in the room, and use a dehumidifier to let the carpet dry naturally for at least 24 hours. Don’t walk on the area or allow pets to interfere with it while it’s drying as the mold is still “alive” and can potentially be spread. Clean the bristle brush and dustpan of any mold spores by scrubbing with hot soapy water, then spraying with anti-fungal treatment and allowing to dry completely. Dispose of the rag and the rubber gloves. Once the carpet has dried thoroughly, re-apply the anti-fungal treatment as in Step 4, then follow with Steps 5 and 6, using a clean, fresh, disposable rag to blot. Discard the rag after blotting. Allow the dehumidifiers to run for a few more days to remove mold spores from the air too. After the carpeting has dried fully, you should be mold-free. Don’t take this for granted, though. Continue checking the spot every day or so for a few weeks to ensure that mold growth hasn’t returned. It can be a slow recurrence, especially if you were unable to remove or lift the carpet, so give it a month before you completely rest easy. • Don’t set potted plants directly onto carpet, not even with a water tray underneath. Use only glazed pots, not terracotta, on carpeting and use a moisture barrier, such as a rubber tray or mat. • Never pile firewood onto carpet; always have a moisture barrier between the wood and carpet. • If your pet has relieved itself in an area more than once, speak to your local pet store about deterrent sprays that can make the spot less appealing for Fido or Chairman Meow. • With humid areas or a humid home, invest in quality dehumidifiers to keep moisture at a constant minimum. This will protect hardwood flooring and artwork as well as carpeting.